As the robot carefully pushes against a block, a computer takes in visual and tactile feedback from its camera and cuff, and compares these measurements to moves that the robot previously made. It also considers the outcomes of those moves -- specifically, whether a block, in a certain configuration and pushed with a certain amount of force, was successfully extracted or not. In real-time, the robot then "learns" whether to keep pushing or move to a new block, in order to keep the tower from falling. In the game of Jenga -- Swahili for "build" -- 54 rectangular blocks are stacked in 18 layers of three blocks each, with the blocks in each layer oriented perpendicular to the blocks below. The aim of the game is to carefully extract a block and place it at the top of the tower, thus building a new level, without toppling the entire structure. 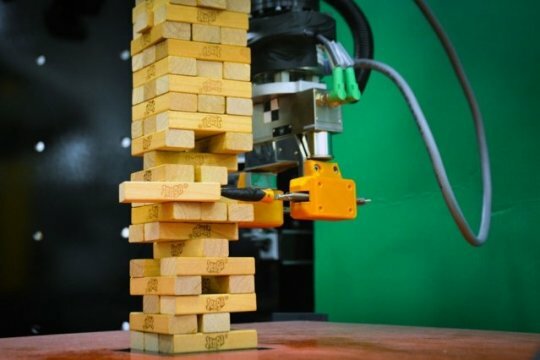 To program a robot to play Jenga, traditional machine-learning schemes might require capturing everything that could possibly happen between a block, the robot, and the tower -- an expensive computational task requiring data from thousands if not tens of thousands of block-extraction attempts.